Before I start bigging up my latest recipe I have to just apologies, not simply for being away for so long, but for flashing up massive pictures of barbecue food whenever you visit my site. I’m not going crazy by thinking it’s acceptable to be outside cooking in 3’C and in the dark (I’m much more of a cozy fire person right now), no, my blog has in fact broken and I am in the process of getting it fixed! – I sometimes do think I would have been much better off doing an I.T based degree than sociology, but hey ho! I can at least promise you that you don’t need any skills to make this recipe, just a waffle machine, and as you only have to plug it in and turn it on I don’t think too much can go wrong!! You may or may not have previously learnt that this year I invested in a waffle machine, and I have to say that since I have, breakfasts in our house have been seriously elevated! I no longer just fry-up a bacon butty or whip-up some scrambled egg… we are all about the waffles these days (and if you saw my Instagram yesterday you will have seen the latest waffle delight!)! Now I’m not a sweet toothed person, especially at breakfast, and to be honest if you put a bowl of muesli in front of me at the weekend I would probably cry. Weekends are for really enjoying breakfast time (often in bed), and making up whatever the hell you fancy, and conveniently have in the fridge! This recipe is so much more exciting than a butty or bowl of cereal, and I promise will set you up for a happy day ahead!! Preheat the waffle iron according to the instructions. In a mixing bowl (I use one with a lip for easy pouring), fold together the flour, sugar, baking powder, and salt and set aside. In a separate bowl, whisk together all the wet ingredients until light and fluffy and gently fold this into the dry mixture until just combines (you don’t want to over mix it). 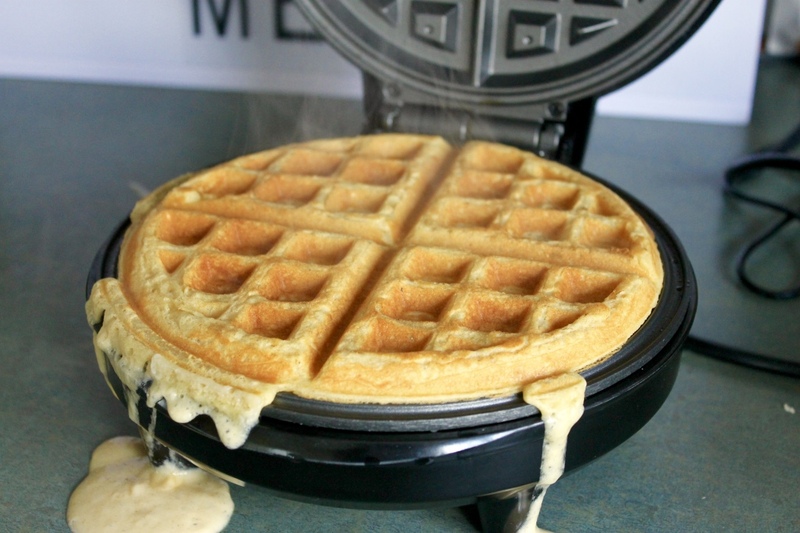 Once the waffle iron has preheated, spray both the top and bottom with oil and pour enough batter into the waffle iron to just cover the waffle grid. Close the iron and cook the waffle for about 5 minutes, until golden brown. Tip: To prevent the waffles from getting soggy, toss them— one at a time— back and forth between your hands a few times to help release any steam. Repeat with the other waffle/waffles until all cooked (you can keep them warm in a low-heated oven if necessary). Once all elements are cooked, plate up your waffles and top with all the ingredients. This looks amazing, now I need to get a waffle maker! Thanks – they are a really fun purchase. I think I got mine quite cheap off amazon! I got giftet with a waffle maker about one year ago and I feel ashamed to say that I haven’t used it once yet!!! But this recepi will be for sure my reason to try it! Thanks for sharing! Yum! Hi Silvia, I know the feeling…. I have a pop-cake machine in the cupboard that has never even made it out the box!! We had an ancient waffle maker when I was growing up. Every now and then, Mom would pull it out of the bottom cupboard and make enough waffles to feed a small army, and it was always good. Nothing fancy. Waffles with bacon and maple syrup. I kind of miss them. Today we have a small kitchen and any appliances we don’t use all the time find their way to the basement where it becomes prohibitively difficult to dig them out and use them. If I had one more cupboard in the kitchen, big enough for a waffle maker and a few other “occasional appliances”, I would get one in a flash. Your concoction looks delicious and I want to eat exactly that right now, Please send some through the internet waffle portal immediately. Ahhhh…. I wish I could post you some!! Although if it’s any consolation, my waffle make (along with my toast machine, spiriliser and other random kitchen bits) all live on top of my cupboards and I have to get a stool out to get at them! I love waffles! And I do have a waffle maker, but I have not made waffles in years after a couple of disasters. I blame it all on the recipe I used! Now that you have posted yours, I think I will have to be brave enough to try it enough because your creation looks so very delicious! 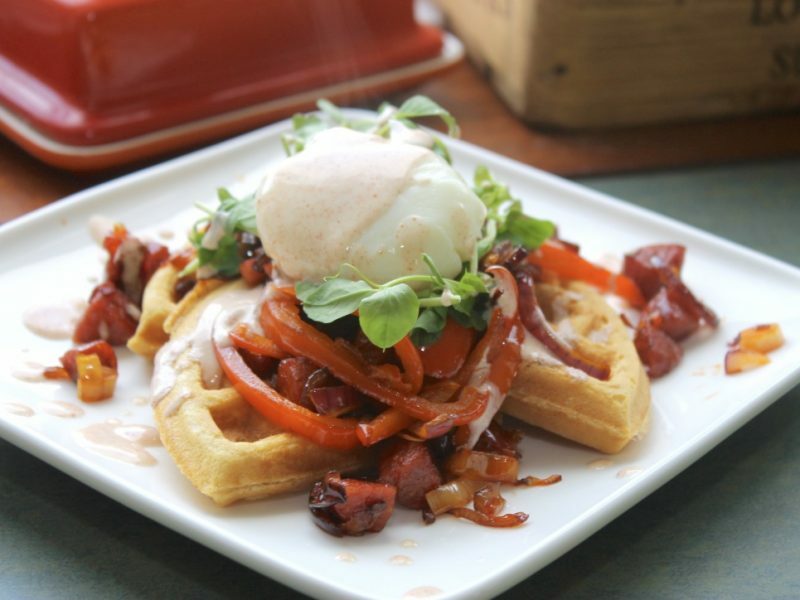 Yet another reason to pull out my waffle maker and indulge in this great recipe ! !